At a collaborative laboratory called BRAMS, scientists from five Canadian universities are unlocking the mysteries of the brain through music and sound. McGill neuroscientist Robert Zatorre has a standard answer whenever he’s asked whether there is a musical region to the human brain. Music taps into so many processes, explains Zatorre, the co-director of the International Laboratory for Brain, Music and Sound Research (BRAMS). Hearing, memory, planning, motor control, timing, emotion. The breadth of music’s reach across the topography of the brain makes it ideal terrain for research. Zatorre shares directorial duties at BRAMS with Université de Montréal psychologist Isabelle Peretz. 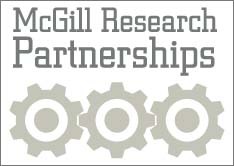 BRAMS brings together researchers—drawn from neuroscience, psychology, music, audiology, education, computer science and engineering—from McGill, Concordia University, McMaster University, the Rotman Research Institute in Toronto and Université de Montréal (U de M). Since forming in 2004, the collaborative lab has earned high praise, being called “an unbeatable team” and “number one by a long shot” in Science magazine. When we use language, or recall a memory, or make music, we’re calling upon dozens of regions of the brain simultaneously—and BRAMS researchers have a fundamental goal of building a better understanding of the relationship between these regions. Unlike speech, playing an instrument is a specialized skill, and it offers a perfect opportunity to examine the learning process. Insight into how the regions of the brain interact through music could even lead to better rehabilitative therapies for stroke victims, or for people with Parkinson’s disease. BRAMS pools not only research savvy, but space and cost ly equipment. On-site at U de M, researchers can access a professional recording studio, EEG and audio testing labs, a transcranial magnetic stimulation lab to study brain activity using magnetic fields, and an echo-free chamber for experiments in the perception of sound. Technologies for studying musicians’ movements and measuring audience response are available on the other side of the mountain, at McGill’s Schulich School of Music, and brain imaging resources are available at the Montreal Neurological Institute. 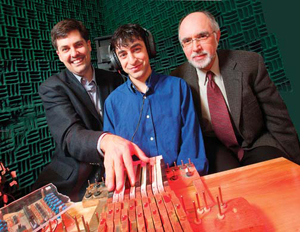 Avrum Hollinger (middle), a graduate student in Marcelo Wanderley’s (left) electrical engineering lab, built a metal-free keyboard that can be played inside a highly magnetic MRI machine. The special instrument now makes it possible for neuroscientist Robert Zatorre (right) to monitor musicians’ brain activity while they play. It is inside the MNI, in fact, that Zatorre, psychologist Virginia Penhune from Concordia University, and electrical engineer Marcelo Wanderley from the Schulich School of Music have begun experiments to find out what goes on inside the brain of a musician—by having them perform inside an MRI scanner. The catch: “The scanner is a very strong magnet,” Zatorre ex plains, “so you cannot put anything metallic in it, or even any wires, because they create cur rents that heat up and are extremely dangerous.” Regular instruments were clearly unfeasible, so Zatorre and Penhune approached Wanderley, whose lab designs new digital musical instruments. They challenged him to build an MRI-compatible instrument that used no ferromagnetic materials, one that could be played inside the narrow constraints of the scanner tube and also be monitored by computer. Avrum Hollinger, then a master’s student in Wanderley’s lab and now working on his PhD in music technology at the Schulich School of Music, got to work, beginning humbly with a section of battered keyboard that he had hacked off a clunker from a local piano repair shop. When he finished, they had an 11-key instrument, mounted on Plexiglas, that used fibre optic cable to send light signals to a controller outside the scanner room and create MIDI-triggered sound. The MRI-compatible keyboard means the researchers can monitor musicians’ brains and at the same time record every aspect of their playing through the fibre optic system. The MRI images and data this generates will provide a view into the brain never seen before. The suite of MRI-compatible instruments will allow the researchers to examine the different brain activity generated by each one. A keyboard, for instance, calls for fairly symmetrical motor control of the two hands, and the cello, very asymmetrical control. A clarinet or oboe will add the brain’s management of breathing and embouchure to the resulting neural picture. The views into the brain these instruments open up are manifold. Zatorre ultimately sees BRAMS and its shared infrastructure and expertise spurring researchers to tackle all sorts of new questions together. The BRAMS lab has received $14 million in funding for infrastructure from the Canada Foundation for Innovation.